Discovering that a candidate has an arrest record should not be taken lightly; however, you may want to think twice before you automatically dismiss that candidate. Using a candidate’s criminal history to make employment decisions could violate certain rules and regulations set forth by the EEOC. In other words, it could get you in big legal trouble. 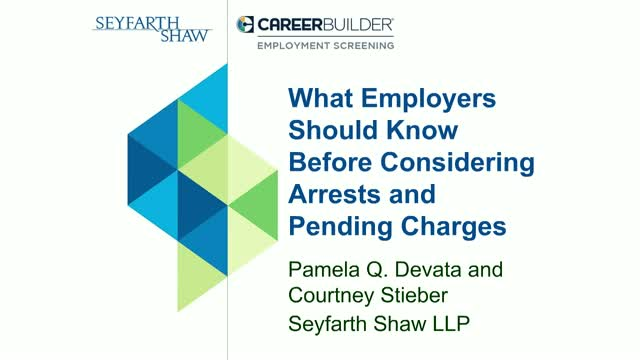 In this webinar, employment law experts Pamela Devata and Courtney Stieber will help you make sense of the rules around dealing with candidates who have arrests and pending charges. -How to navigate ban the box regulations and other local and state laws. -The EEOC’s guidance on arrests and pending charges. -Best practices when considering pending cases in employment decisions. Join this webinar to learn about the importance of conducting thorough background checks, monitoring employees throughout their employment and the role background checks can play in that process, along with screening tools available to help you ensure your program is aligned with your organization’s risk mitigation goals to assure a safe and secure work environment. As it stands today, 46 of the 50 states in our country authorize either the personal and/or medical use of marijuana or cannabidiol (CBD). One in four Americans now lives in a state where cannabis use is fully legal for all adults. With stats like that, there are sure to be impacts to today's workplace environments that employers need to be aware of and most importantly, be prepared for. With new laws come new rules and court decisions for employers to navigate. We will review the top concerns for the workplace along with tools for employers to stay ahead of these fast-changing rules. Join Laura Randazzo, VP of Compliance at CareerBuilder Employment Screening, and William J. Judge from the Drug Screening Compliance Institute,as they walk you through everything you need to know about how marijuana legalization impacts your screening process. If you feel like you lost momentum over the holiday season, CareerBuilder’s latest enhancements to Applicant Tracking will make you feel as if you never missed a beat. Join us for a 30-minute webinar to learn about the new system tools, and how they pave the way for you to work faster and more effectively in the New Year. Hosts Mary Prendergast and Jason Bartusch will also offer advice and tips to simplify tasks in your applicant tracking system, increase your momentum and truly ‘hit the ground working’ in 2019. If you feel like you lost momentum over the holiday season, CareerBuilder’s latest Talent Discovery Platform enhancements will make you feel as if you never missed a beat. Join us for a 30-minute webinar to learn about the new system tools, and how they pave the way for you to work faster and more effectively in the New Year. Hosts Mary Prendergast and Jason Bartusch will also offer advice and tips to simplify tasks in Talent Discovery, increase your momentum, and truly ‘hit the ground working’ in 2019. Navigating the ever-changing laws – both domestic and international – can be overwhelming, not to mention confusing. The recent GDPR changes are no exception – especially since non-compliance carries a high price tag. CareerBuilder is here to help. Join Laura Randazzo, VP of Compliance at CareerBuilder Employment Screening, and John P. Tomaszewski, Partner at Seyfarth Shaw LLP, for a webinar about the new GDPR mandates and what it means for organizations here and abroad. In this new webinar from the talent acquisition experts at CareerBuilder, you’ll learn best practices for sourcing quality candidates through Talent Discovery fast. For instance, do you know how to tap into the dual power of Boolean and semantic search? Enhance the sourcing skills you already have while mastering all-new techniques. Sign up today. We’ve been very busy this summer – and not at the beach. Over the past three months, we’ve been working hard on improving our products, so they can help you achieve your hiring and HR goals faster and easier than ever before. Curious to know what we’ve accomplished? Join our Product and Marketing Team at a new webinar on Thursday, September 27 at 12:00 p.m. CT, as we reveal new product innovations and updates to existing solutions. We are always working to improve our products to ensure they help our customers meet – and exceed – their recruitment goals. We’ve made some exciting changes to our Applicant Tracking solution, and we want to share what we’ve accomplished and where we’re headed. Join Brian Gaspar, VP of Product Development and Design at CareerBuilder, for a new webinar on Tuesday, September 25 at 1 p.m. CST, as he reveals recent enhancements we’ve made to CareerBuilder Applicant Tracking, updates currently in progress, and our roadmap for future product innovations. On average, CareerBuilder’s Applicant Tracking System delivers twice as many applications as the average ATS and decreases time-to-hire by six days. In this webinar, CareerBuilder recruitment expert Devon Butterfield will discuss how CareerBuilder’s ATS works differently to deliver superior results that save our customers time and money. Learn how we combine leading-edge technology, labor market data and superior customer service to: enhance communication between hiring managers and candidates; create a seamless, automated workflow; and elevate your decision-making process. Attendees will see a demonstration of our top ATS features at work. For existing CareerBuilder Applicant Tracking customers, this is a great opportunity to learn about new and upcoming features for your current system. In April, USCIS announced changes to the E-Verify program in effort to improve the user experience, reduce errors and improve the speed and accuracy of employment verification. What are these changes and what do they mean for you? Join us for a new webinar to find out. Register today for Getting to Know the New E-Verify on Thursday, May 31, 2018 at 11:00 AM (CST) In this free webinar, E-Verify expert Sue Kohlwey of the U.S. Department of Homeland Security will discuss the latest updates to E-Verify point by point and how they will affect both employers and employees. She will also offer advice for navigating these changes and applying them to your own process. What you need to know about FCRA compliance when conducting background checks. Background checks are key to ensuring a safe, secure workplace; however, they also require taking specific steps to ensure compliance with the Fair Credit Reporting Act (FCRA) – and that is no small task. A new webinar from CareerBuilder will help you better understand what you need to do to stay FCRA compliant. • The latest insights as they relate to the Fair Credit Reporting Act (FCRA). • What you need to know to remain FCRA-compliant. • How to align your screening practices with FCRA regulations. • How the right background check partner can help you navigate these complex issues. A growing number of states have or are planning to legalize marijuana for medical or recreational use. At the same time, many are also dealing with the opioid epidemic plaguing the country. Many states limit adverse employment action for medical marijuana use, and in Maine, employers can’t discriminate against an employee for off-duty marijuana use. As a result, employers are faced with complex challenges related to state human rights issues, state compliance issues and the increasing cost of noncompliance. Arm yourself with the most up-to-date information on drug testing and compliance during our new webinar Drug Testing: The Impact to State Laws and Employers on March 27 at 12 p.m. Central. Hosts Laura Randazzo, VP of Compliance at CareerBuilder Employment Screening, and Bill Judge, attorney and co-founder of Encompass Compliance Corp, will discuss how these issues impact HR teams and offer practical solutions for being prepared. With approximately 3 billion people in the global workforce, the HR technology marketplace is constantly evolving. CareerBuilder research shows that the average recruiter uses over a dozen tech solutions to search for candidates. Unfortunately, that inefficiency is costing companies great talent (and valuable time). As a global, end-to-end human capital solutions company, CareerBuilder is committed to staying ahead of technology trends to help you recruit and hire more efficiently. Let us show you how! Stefanie Murauskas, Global Solutions Architect at CareerBuilder, will join Nazanin Codd, Director of Recruiting and Human Resources at HITT Contracting, to discuss how companies are using HR tech to streamline their recruitment efforts in an exclusive CareerBuilder webinar, “Ramp Up Your Recruitment Strategy with the Right Technology,” on Feb. 14 and 12 p.m. CT.
CareerBuilder collaborated with Inavero to develop The Staffing Advantage Report - proprietary research based on responses from staffing industry clients, job candidates and staffing employees. This research offers insights into key trends and performance benchmarks for the staffing industry with the goal of helping staffing firms be more effective and productive. Join Eric Gregg and Kyle Braun as they share a deeper dive into the Staffing Advantage Research and offer valuable information to help staffing firms position for a strong growth trajectory in 2018. Did you know that 74 percent of candidates continue to apply for jobs after accepting your offer? That means any delay on your company’s end—particularly during the background check process—can cost you valuable talent. And most delays are a sign of inefficiency. CareerBuilder is committed to helping you streamline your pre-hire through post-hire processes to ensure you achieve maximum ROI from your recruitment efforts. Let us show you how! Mary Delaney and Ben Goldberg of CareerBuilder Employment Screening, will share valuable insights into implementing efficient employment screening practices in an exclusive CareerBuilder webinar, “From Requisition to Background Check, Your Hiring Process Should be Efficient,” on Tuesday, Jan. 30 at 12 p.m. CT. Arm yourself with crucial up-to-date information about background screening. Simply modifying employment applications is no longer enough to comply with the wide array of restrictions now placed on employers. Laura Randazzo, VP, Compliance at CareerBuilder, will discuss how these trends impact HR teams, and offer solutions on what to do right now to stay out in front. • Current legal and regulatory activity, such as ban the box, the use of criminal records, class action litigation, salary restriction regulations, and other emerging trends. • Employer best practices to maintain compliance programs while achieving core-screening objectives. • Insights into the latest candidate experience research, so you can walk away with a solid understanding of how to align screening practices with the best possible experience for candidates. The “ban the box” (now, perhaps more accurately “Fair Chance Act”) and “salary history ban” trends continue to catch fire, with California just the latest jurisdiction to adopt new laws. Simply modifying employment applications is no longer enough to comply with the wide array of restrictions now placed on employers. The trends hit staffing agencies and PEOs perhaps the hardest. Agencies and PEOs have a high volume of candidates to screen, increasing the chances of a costly error slipping through the cracks. Moreover, client requirements and business needs often can seem to conflict with a compliant or “50 state universal” solution. Bill Simmons, labor law attorney at Littler, will discuss how these new laws impact staffing firms and offer solutions on what to do right now to stay out in front. Artificial intelligence, Google for Jobs and other hot topics are dominating conversations across the recruitment industry. But at the end of the day, do they really impact your business? With new recruitment trends popping up all the time, you need to know which ones are worth getting behind — and which fleeting ones you can afford to ignore. Most importantly, you need to be able to cut through the noise and align your business around strategies that will position you firmly ahead of your competition in 2018 and beyond. Talent acquisition experts Tim Sackett and Kris Dunn will join CareerBuilder’s Scott Helmes to help you determine which recruitment trends are worth getting behind and where you need to invest more time and resources in the coming year. Join our webcasts focused on best practices and insights for the Talent Acquisition space for recruiters, managers, directors, hiring managers and anyone who wants to learn about the latest recruitment trends across all industries.